Good-looking interface, lots of free options offered on the main page, and nice testimonials – these are the main details we see when opening the JustBuyEssay paper writing service. Is this description relevant to their real service that this company provides? It is what we are going to tell you at the end of this JustBuyEssay review after conducting an experiment. We have ordered an article at this website, paid money, and underwent the step-by-step procedure of getting the task done. Now we are ready to share with you our real experience so that you know what to expect when making an order at this essay writing service. To begin making an order, a student has to click on the table situated conveniently on the right of the main page. Here you can also see the variety of writing types. The program offers three main sub-kinds. These are editing, writing, and slides. It means that here we can also order a Powerpoint presentation, which is a huge plus for this essay service. There is an option of selecting the academic level of your essay typer. We assume that it is where the further choosing process goes subdivided to get the most suitable writer for the client. We have clicked on the college level. Now we got to the deadline option. The earliest one is 6 hours which is pretty good for any student who needs to get a short essay on a simple topic. We have decided to take three days for the deadline, and the system showed $60 to pay. After clicking the proceed bottom, we get to the following page which has much more subdivided categories to include. Here you can add all the details about your paper. It’s vital to mention that all the main aspects are included: format, title, spacing, and even the option of express checkout. It is really convenient and quick for students. However, in the next sections, we will discover something more intriguing about the facts which JustBuyEssay tried to hide on their website. When talking about service, we have decided to find the JustBuyEssay сomment function with the available feedbacks online. It is vital to mention in this JustBuyEssay overview that the feedback system is not included as well. 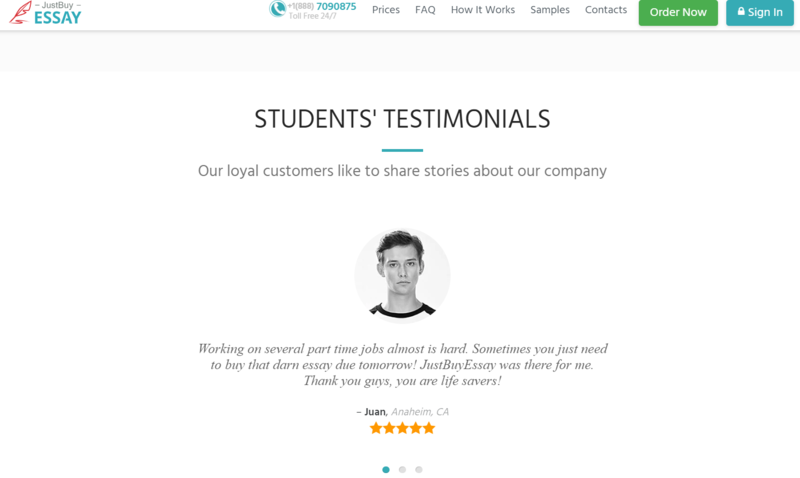 Although you can see positive testimonials at the end of the main page when scrolling it down, they don’t look quite realistic. Smiling people look like Google images taken from the free pictures. We say this firmly because after receiving the order there wasn’t any opportunity to leave our feedback. Even when we asked to write the feedback, the support service representative kindly explained that not all customers can leave their opinion about the service. Anyway, it’s up to you to decide whether to believe these testimonials or take them with a pinch of salt. We didn’t stop on reading only positive “mechanic” testimonials offered on the website but went further. There are lots of other unbiased websites where students share their real-life experience of using similar college essay editing service. We were taken aback when started to read only negative comments: high prices, missed deadlines, high plagiarism rate. I scrolled down the comments and managed to find lots of positive ones as well: discounts offers, high quality, professional attitude. We couldn’t understand how one and the same service can receive so different testimonials. And we decided that the user experience depended on the writer that you get as well as the support service representative. The quality may vary but it’s not news that such services depend on the human factor. Taking objectively the pricing of this essay editing service, we have come to the conclusion that the pricing is still higher than average. The price doesn’t very much if you take longer or shorter deadlines. For our 3 pages essay on a simple topic for 3 days paying $60 dollars is honestly too much. If I have that assignment, I would rather prepare this essay by myself. 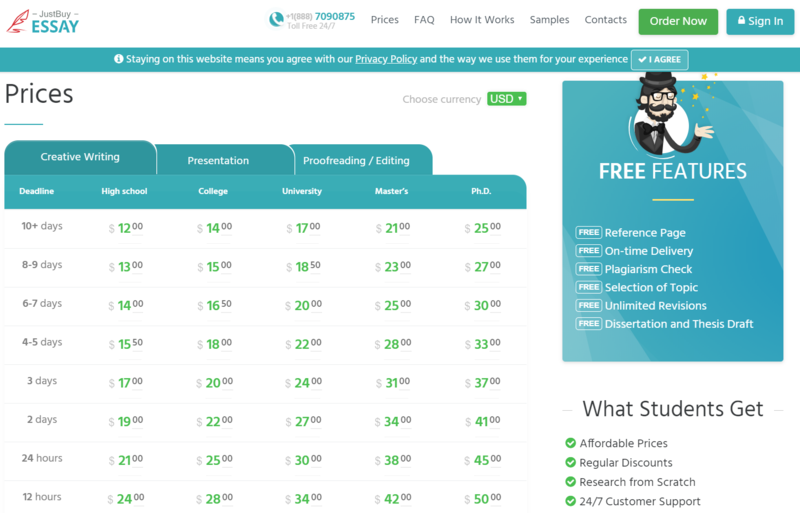 As for the editing service, it is cheaper but higher in $5-10 than other similar websites. One thing that attracts loyal customers at JustBuyEssay is the discount option. Not many websites offer this opportunity for clients. All you have to do is to type the code which you get when inviting a friend or taking new orders. This system of loyalty does attract previous clients to order more papers only here. For these reasons, the initial high price can be explained. Before we have received the final paper we decided to browse via the website to find samples or free texts. There is a category with such works on the sample papers page. However, there weren’t many articles available. Moreover, the spectrum of subjects is very narrow. It looks that the company has only started to develop this category. Also, the database is not available online for free. You need to pay to get the entire text. At this moment there are not enough papers for understanding the quality of texts. When we have received our 3-pages essay, we gave it to a professional editor for clarifying the real quality. He said that the paper was well-structured with a clear thesis statement. The topic sentences, arguments, and examples were put in a logical way to convince the reader. However, there were several minor mistakes in grammar which deprived us of saying that the text is ideal. Having said that, the essay was well-written and deserved an A. We received the paper on time without any delays. It shows that 3 days were enough for the company to prepare the work before the deadline. Although we don’t know what happens with hot orders with the deadline of 6 hours, we can say that the average timing is met well. Website. A simple interface, availability of urgent order from 6 hours, the ability to specify all the main details of the work. Quality of service – justbuyessay review. Good quality, students can get a mark A. Delivery. Online service provides work without delay. Discounts. The service offers a good discount system for its regular customers. Quality of service. The quality of work and service directly depends on who is the executor. Reviews. Real customers have no opportunity to leave a review, most likely available reviews on the site fake. High prices. Prices are higher than average, for the urgent orders the price is too high. Taking everything into account, we would like to highlight the key positive and negative features of using the JustBuyEssay service. We’ll begin with the negative ones: high prices for papers even with longer deadlines, false feedbacks on the website, many negative comments from real students, a small database with samples. As to the positive aspects: availability of very urgent tasks, clear interface for making an order, quick order processing, discounts system, high-quality texts, and clear subdivision of task requirements. For these reasons, we can put the final grade of 7 out of 10 because of the mentioned above results. Read more on this website blog to find out about other writing services and true client’s experience.